When we process classified documents under the FOIA, they undergo an initial review by technical personnel (subject matter experts) to verify classification and bracket information that is withholdable. The documents are then sent for a legal review. This part of the process typically takes at least six (6) months. After those reviews are complete, classified documents are sent to DOE’s Office of Document Reviews to conduct the second and final review. That office identifies all classified and sensitive information for redaction. This process may take up to two (2) or more years. 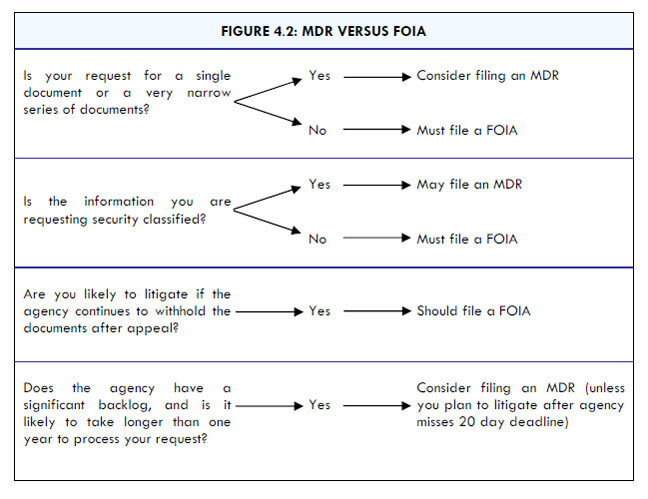 An MDR request is usually processed more quickly than a FOIA request (one review instead of two). DOE’s Office of Document Reviews locates the document, reviews, declassifies, redacts, and sends to requester without FOIA involvement. You may view their website at http://www.hss.energy.gov/Classification/DocReviews/. After you have had some time to consider your options, please let me know how you wish to proceed.